With unrestricted views of Arc de Triomphe this business center is spread over 2,000m² and consists of 36 fully equipped and renovated offices along with nine meeting rooms and conference space that can accommodate between eight and 200 people. Within the immediate area, there is an Opera House, multiple parking facilities, and an abundance of road links to make the centre as accessible as possible. The Théâtre Nanterre-Amandiers is just across the park. 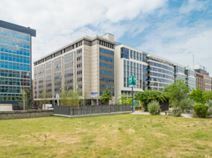 The workspace is located in the heart of Nanterre, offering many day-to-day amenities within walking distance. Gare de Nanterre Préfecture Metro station is located a short two-minute walk away from the space and buses run through the area often. If commuting to work by car is something you do more often you can make use of the 2 parking garages and the underground car park one-minute away from the space. This efficient building is set in a popular business district in Greater Paris. Highly accessible from the RER station, this centre offers a range of offices in a pleasant and comfortable business setting. Parking is available. A big benefit is the transport infrastructure close to the centre, but also its proximity to Nanterre University and its potential talent pool. Another plus is the authorities’ encouragement and support of small and medium sized green businesses, corporate and hi-tech services.